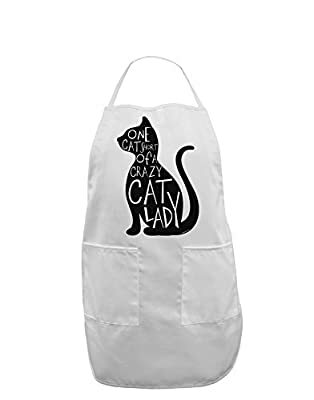 Made for all the almost-crazy cat ladies out there. Show your crazy cat lady pride with this One Cat Short of a Crazy Cat Lady design. These fun printed garments are a great personal touch on you, or as a gift to a friend or loved one! Great for all-year-round too! Colors may differ from image, as each monitor is made and calibrated differently. Unisex styling and sizing with adjustable tie straps and neck strap. Straps adjustable up to about 66" around. Apron has 2 hip pockets. Print may be placed or sized differently, and colors may appear slightly different, than in the image shown. Unique, copyrighted design by TooLoud (Trademark) brand. Authentic TooLoud brand, printed in the USA with pride. This is not an unauthorized replica or counterfeit item. This is an original inspired design and does not infringe on any rights holders rights. The words used in the title and/or search terms are not intended to imply they are licensed by any rights holders.